When you get lost between the moon and New York City, you fall in love. When you're a rotten flimflam man named Eric Stanton (no relation to the great pin-up artist) lost between Los Angeles and San Francisco, the best that you can do is a dame named Stella – a money grubbing grump with a beautiful face and knock-out body that steals from the little diner she waitresses at and makes no qualms about wanting a man who can provide her with the finer things. Like almost every other man in town, she has Eric wrapped around her finger in no time flat and he leaves behind the prospect of joining a pair of swindling performing mediums to stay on in town and win her love. The only way to win Stella over is with money though, and there's only one place he can think to get it. Enter the kind-hearted blond who's none to dumb when it comes to books but falls for him and his scam like a brick. 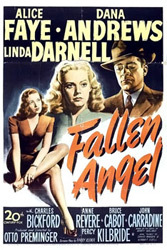 Directed by Preminger after the very successful Laura, Fallen Angel never got the same praise, and it's admittedly a smaller note in the annals of noir history. With a great performances by Linda Darnell as the bitchy Stella and Alice Faye (who all but ended her career when she walked away from the studio after so much of her role was cut from the film) as the earnest and lovesick foil, June, it's definitely worth checking out if you're in the mood for a classic noir on Netflix Instant.